Many of you probably remember the days where you had to blow out those cartridges and keep on tinkering with them to get them to work, some of you may not. The Nintendo 64 was released in 1996 and had the best graphics over the other systems. If you want the specifics the N64 used trilinear filtering when the other systems like the PlayStation used nearest-neighbor interpolation. Because of the trilinear filtering, the N64 had very smooth graphics unlike the competing systems which had graphics that were pixelated. However, the system couldn't handle a lot of more high quality graphics so many of those graphics had to be "dumbed down", making them more blurry. 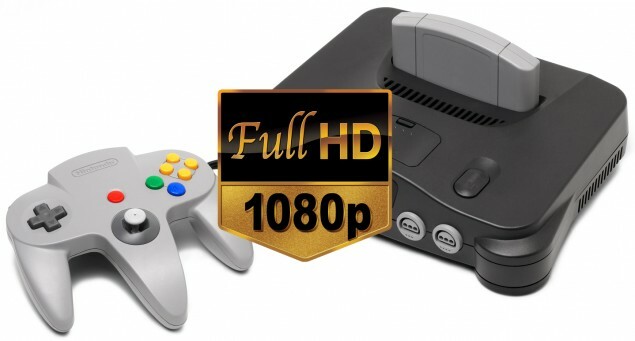 You wouldn't really care before HD televisions became more common, but if you look at N64 graphics compared to today's 1080p graphics, the N64 had 480p graphics. You've seen the difference between 480p and 1080p (or at least 720p) on videos on YouTube. There is a very distinct difference in quality! Well, the 23 year old designer, who's name is Marshall, of RetroActive has decided to take the N64 to the next level! Have you wanted to get rid of those 3 cables? The red, white, and yellow cable to be exact. Well, Mr. Marshall has made it possible with his new project! Some of you may be thinking to yourselves that this is a stupid idea considering the fact that it's not a HD game. Well, in some way you are correct in your statement. Let's look at it like this. You have a low quality image on a low quality screen, it will look really low quality no matter what. However, if you put it on a high quality screen you can make out more of the image than you could before and it's more clear and it seems higher quality. Same thing applies with this project. Though the games are not made in HD, they look better and more clear with the option to go HD. Mr. Marshall has provided some pictures, I will show you two of them along with the captions he posted with them. "The city scene from the MGC 2011 demo. You can make out every single pixel. Moire effect is due to my camera." "A game with a nice high-resolution intro screen. You can see the error diffusion dithering on the sun flare clear as day." "Tentative release date is Q1 2014. To be honest it's one of many things I have going on, and I'd rather not release a crappy product, so it'll be done when it's done." "This is not a plug and play board. Soldering is required. Since it attaches directly to the output of the RCP before any video processing is done, it requires fine pitch soldering skills to install. I will not provide installation services. However, some people in the community may choose to purchase a lot of 20-30 units from me and sell N64s with the board already installed."